Wombats are large, lumbering marsupials which live only in Australia. They grow to a length of about 3 feet (1m) and weigh approximately 88 lbs (40kg). Wombats live in burrows which they dig in the ground. To assist with their burrowing, they have thick, muscular legs and strong claws. 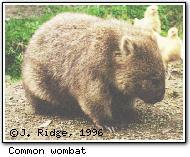 Common wombats (pictured) are found in Tasmania and in some parts of New South Wales. Hairy-nosed wombats are rarer and found only in the more arid regions of Australia. Wombats usually forage for food at either dawn or dusk, avoiding activity during the hotter parts of the day, when they often bask in the sun at their burrow entrance. Wattle the wombat, 1.98Mb QuickTime movie. 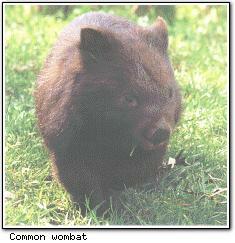 Wombats generally eat grasses and leaves in bush clearings. The wombat population in Tasmania is significant, and wombats tunneling under fences after grazing on farmlands sometimes annoys farmers. Burrows are usually well hidden and wild wombats are not often seen by the public.